RFC 1ST X1 arrow-rightCreated with Sketch. 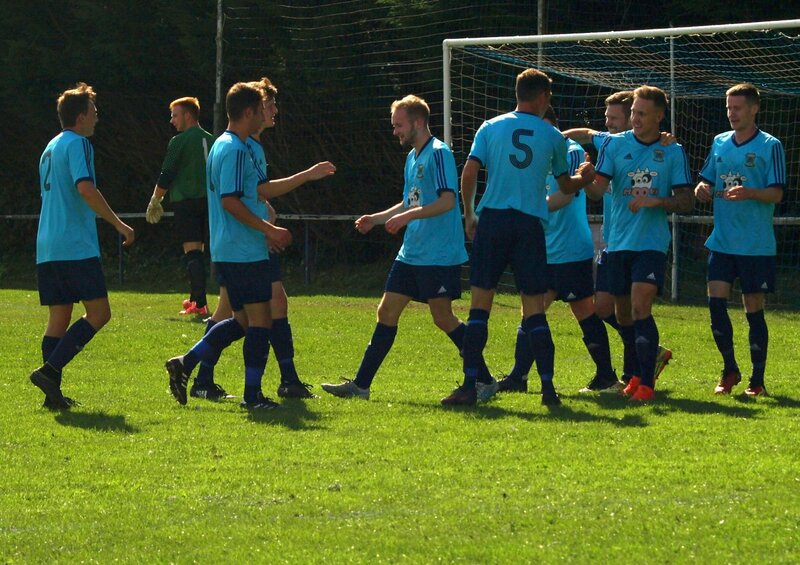 Reshuffling their pack in response to an unfortunate half-time deficit, Ringmer stormed back against tiring visitors Bexhill United in a hard-fought final day tie to seal a campaign-affirming victory and cap their season in style, reports Will Hugall. Inevitably altering the depleted starting XI that slumped to a 4-0 deficit and eventually succumbed to a 5-4 defeat at Midhurst & Easebourne a week – and a similarly sweltering afternoon – prior, the Blues rang five changes; Dan Hutchins, Jon Dollery, Tom Shelley, Abu Touray and Danny Davis all returning and taking the places of Shaun Skipper, Brad Tighe, Ryan Collins, Dan Pollard and Mark Pulling. Certainly injecting the greater energy from the outset, the hosts’ crisp passing matched with exacting pressure on the physically slight Pirates, whose only realistic opportunities came through fending off long-distance passes. Forced to make their one and only change as Lewis McGuigan nursed an injury on the bench, the visitors inevitably led a more attacking path as the versatile Zac McEniry reverted to centre-back. While being forced out of their defensive mentality, the Pirates saw their first opportunity arise as striker Terry Robinson charged down Hutchins’ delayed punt out of the back but was beaten by the goalkeeper’s swift recovery. Though reinforcing their expansive game plan with some eye-catching interchange, the Blues soon fell victim to their opponents’ defiance in the 20th minute as Dollery’s right-wing cross faltered and allowed the Pirates to burst out. With Gordon Cuddington and substitute Corey Wheeler linking up to set Robinson away against Tom Shelley, the Blues centre-back misjudged the looped pass and allowed his adversary to smartly chip over Hutchins, whose outstretched palm could not claw away the effort. Under the pressure of a rampant Bexhill frontline, the Blues impressively repelled all efforts and saw chances finally reward their intent while the all-action tempo refused to relent. As both sides flew into challenges, Ringmer began to edge such duels and with captain Jack Rowe-Hurst leading by example, Davis arrived at a challenging mid-air sight ahead of the visiting backline that he could only prod at the rangy Dan Rose. Nonetheless, action did peter out as the half progressed, and particularly after an enforced drinks break, with loose passing, interruptive officiating and Rose’s gamesmanship all stalling proceedings. In one of the few remaining glimpses, Jack Webber’s attempt to streak away from the Pirates backline were hindered by Craig McFarlane’s cynical – and unpunished – tripping endeavours and ultimately ended in injury after overrunning the effort. Meanwhile, the away captain only asserted his villainous status by smashing possession out of the ground to avert danger in what eventually amounted to an age of added time. Introducing Dan Deacon in Webber’s place, thus forcing a tactical rethink as Dollery assumed a more familiar midfield position, the Blues, just as their visitors earlier, returned with organisation and intent only bolstered by their loss. With Jack Phillips glancing a header wide from Dollery’s corner before Touray somehow spurned a seemingly unmissable Rowe-Hurst cross when steaming in at the far post, the Blues edged closer with each move, with further opportunities certain. Though pegged back by continued Bexhill pressure, in the 57th minute the Blues grabbed their equaliser from a highly unlikely situation; Dollery, while vindicating the trust in his offensive ability, working across the edge of the box before Daniel provided a key overlap on the right of the box and somehow emerged from the marking of three Pirates players to wriggle free and loop over Rose into the far netting. Almost engineering his own strike in the 61st minute after charging in to win a free ball from his left-back berth, Adam Willard worked with Matt Daniel and Rowe-Hurst on the left wing before the latter laid into his path on the edge of the 18-yard box, where his angled effort sailed just wide. While Bexhill fought for a clinical second-time lead in their hunt for a 2018-19 FA Cup qualification place, Hutchins did well to deny a low McEniry effort with his boot before heroic Willard defending prevented Cuddington from breaching an exposed Blues backline in the 66th minute. From the full-back’s last-ditch tackle, the overcompensation of the Pirates’ attack impaired them, with Daniel setting Rowe-Hurst away with a perfectly floated pass to the left side of the 18-yard box. As the striker picked his head up, the trap was set with Davis – prowling at the far post – leathering a vintage volley back across Rose to gain a vital lead. Returning some needle to proceedings, Cuddington and Rowe-Hurst’s touchline exchange set the tone for a feisty subsequent period in which Touray just failed to slip through a by-line cross for a certain finish from the Blues’ aforementioned top goalscorer. As Ash Bailey’s substitutions broke the momentum of play, few genuine chances arose and the coastal outfit – rapidly tiring, given their contrasting inability to make changes – were regularly caught offside. Condemning the visitors’ declining cause, Sam Wilkinson was denied on the line after stealing a fast-moving pass from the onrushing Rose’s feet and searching for goal – though greater Blues focus, evident in the restriction of attacking numbers to just a triple-pronged effort, was placed on disciplined, and where not simply brave, defending. Eventually, Hutchins saw the Blues to the close by collecting a series of tame floated passes, and with it sealed the squad’s 4th-place finish in the enthralling fashion that has defined their entire campaign. Listing a flurry of achievements – their loftiest league finish since 2005-06, joint-third highest number of league victories since 1965-66 (when two points were still awarded for a win) and their highest ever number of points amassed in a 34-game season – in their hard-fought and historical 2017-18 term, the Blues, with great competitive encouragement, now begin a summer as busy as ever off the field in preparation for action starting all over again.